As noted previously (here), Drs. Karl Fagerström and Tom Eissenberg have described a continuum of dependence among tobacco and nicotine products. They concluded that cigarettes are the most dependence-producing (addictive) product and that smokeless tobacco is intermediate, evidenced by clinical trials showing that quitting cigarette smoking is more difficult than quitting ST. In a new study published in Nicotine & Tobacco Research (abstract here), I use data from the 2003 Tobacco Use Supplement of the Current Population Survey to directly compare time to first use (TTFU) among smokers and smokeless tobacco users in a nationally representative sample. My collaborators in the work are Nantaporn Plurphanswat, research economist at University of Louisville’s Brown Cancer Center, and Karl Fagerström. 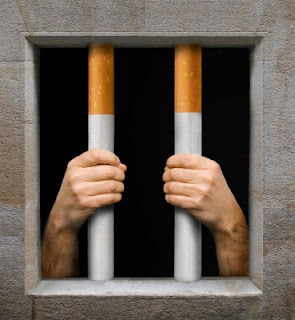 Time to the first cigarette (TTFC) after waking up in the morning is a well-established measure of dependence among smokers – the shorter the TTFC, the stronger the addiction. This measure is the key component of a scale developed in the late 1970s by Dr. Fagerström, for whom the scale is named. 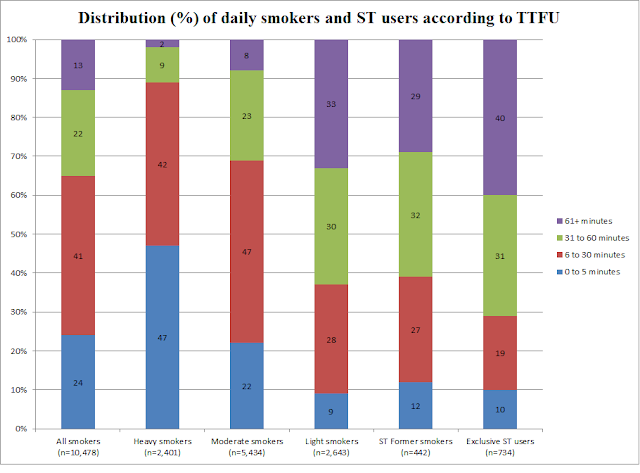 TTFC is strongly correlated with abstinence and time to relapse among smokers enrolled in cessation trials and in nationally representative samples of smokers from four countries. 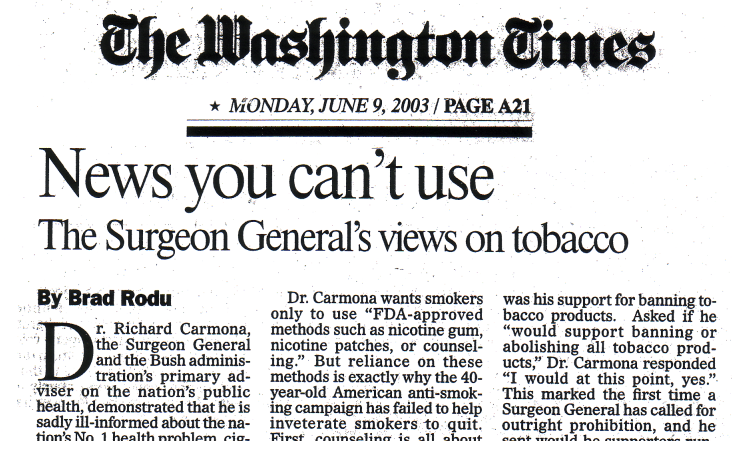 A comparable measure has been developed for smokeless tobacco use. We examined TTFU among 10,500 white men who were daily cigarette smokers and 1,200 who were daily smokeless tobacco users. Smokers were classified according to number of cigarettes per day (cpd) smoked: light (1-14 cpd), moderate (15-24 cpd) and heavy (25+). 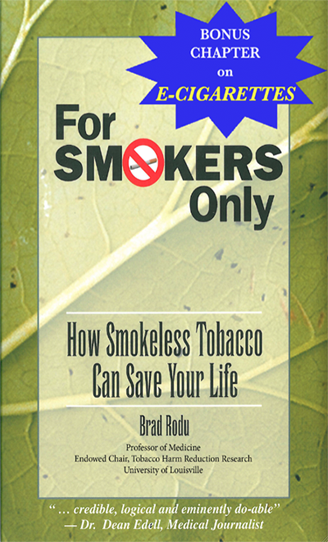 Smokeless tobacco users were subgrouped as exclusive users or former smokers. The results show that dependence among smokeless tobacco users is similar to that among light smokers (1-14 cpd), 9% of whose TTFU was less than 5 minutes, and 23% under 30 minutes. 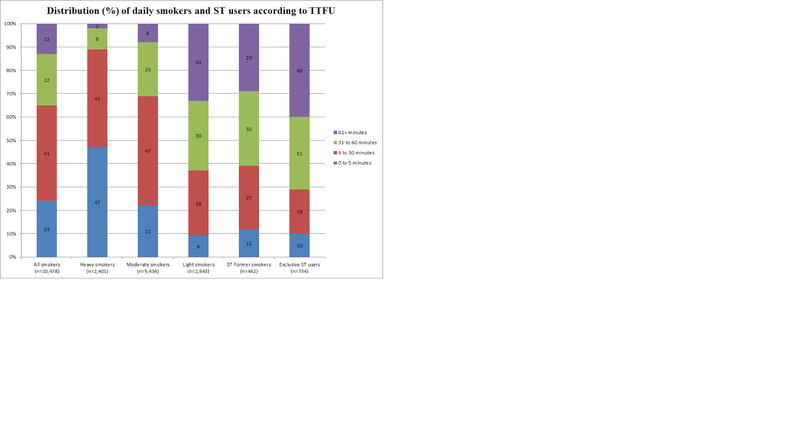 Differences in TTFU between smokers and smokeless tobacco users can be seen in the chart below, which is from our study. Our findings support the Fagerström-Eissenberg hypothesis that the dependence level of cigarettes is generally higher than that of smokeless tobacco. 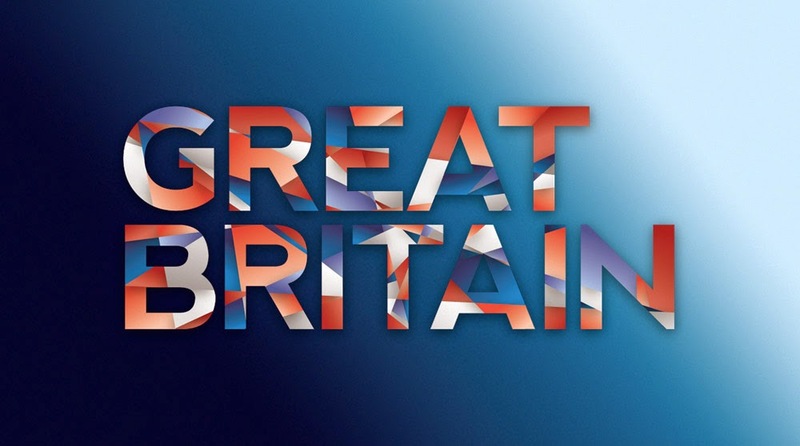 This has positive implications for tobacco harm reduction, which is the substitution of smoke-free tobacco products for cigarettes among smokers unwilling or unable to quit. Switching from smoking to smokeless tobacco use is associated with a huge reduction in health risks. This study adds evidence that a switch to smokeless tobacco might also increase the chances for becoming completely tobacco-free.